The latest startup to enter the fray is Vloggo, which recently launched a website and released an iPhone app through which users can record and upload short video clips to share with friends. The app gives users just 60 seconds for videos that they might want to upload. That’s shorter than apps offering uploads of unspecified length, but a big boost over others, which limit recordings to as little as 15 seconds. Vloggo has all the features one might expect from a social video sharing app, including a feed of videos recently posted by your friends and the ability to record and post videos yourself and share them on social networks like Twitter and Facebook. 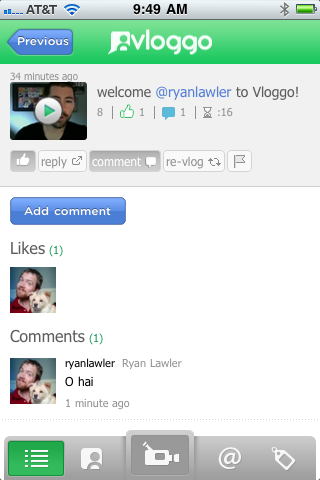 You can tag other Vloggo users in the app, “like” and comment on videos and even reblog them if you think they’re worth sharing with your own followers. 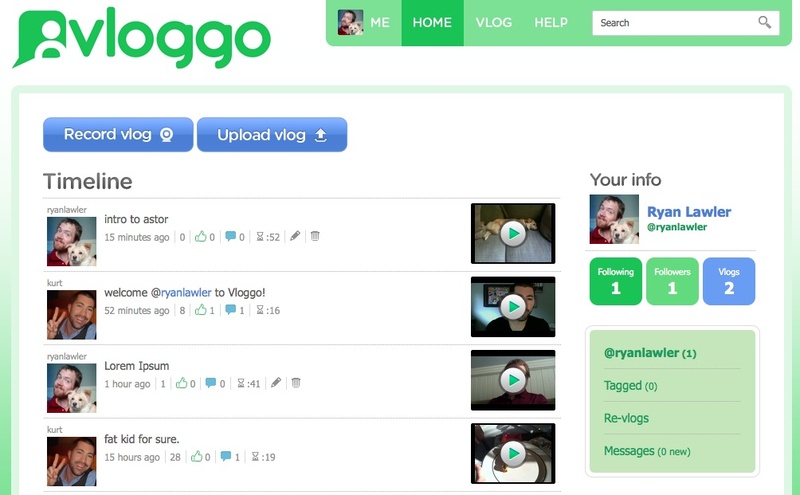 The Vloggo website has all the same features, as well as the ability to upload previously shot videos or to record videos from your webcam. Vloggo founder and CEO Kurt Varner told us in a phone interview that he hopes to provide a service to easily share videos with trusted friends and family in a way that’s not currently supported by video sharing sites like YouTube or social networks like Facebook. In YouTube’s case, discovery of friends’ videos can be a problem on a site that receives 48 hours of video uploaded every minute. And Facebook, while it has become a major source of video consumption, has not made the ability to find friends’ videos intuitive when they’re not posted to someone’s Facebook wall and friend feed. Instead, Vloggo is going up against a new breed of startups that are specifically targeting the mobile video sharing app market. While Vlix and Viddy give users the ability to apply filters, and Socialcam is betting on deep Facebook integration, Vloggo is going for a no-frills approach to social video sharing. But no frills doesn’t mean bad: the app itself is incredibly intuitive and usable, which could actually give it an edge against some apps that might try to do too much. It only takes three clicks to record, post and share a video, for instance which significantly lowers the bar to mass adoption. Varner, a 24-year old former flight test engineer, left his job earlier this year and began building the app full time about three months ago. The project up to now has been self-funded, but he is currently interested in securing funding to build on the app that’s already been released and to expand to other platforms. While still early days, Vloggo hopes to ride the wave of social video sharing and use the network effects of Facebook and Twitter to gain more users.